South Sudan will support Gianni Infantino's bid to be Fifa president. On Friday, the Confederation of African Football (CAF) voted to back the other leading contender, Sheikh Salman bin Ebrahim al-Khalifa of Bahrain. However, the 54 African federations will vote separately in the election to decide Sepp Blatter's successor in Zurich on 26 February. "We are supporting Gianni Infantino for the Fifa presidency," said South Sudan football chief Chabur Goc Alei. 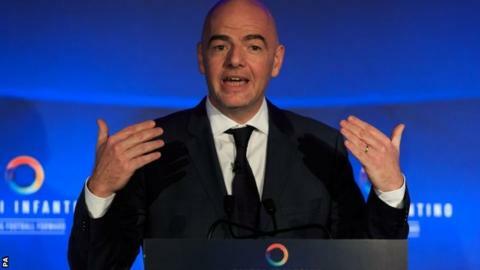 Chabur said Infantino, the preferred candidate of Fifa vice-president and former Manchester United chief executive David Gill, had a better project "for our federation, for Africa and the world". He said he expects more African nations to support Infantino, general secretary of Uefa, who became the confederations' candidate when president Michel Platini was prevented from taking part over the payment scandal that saw him banned from football for eight years. In addition to Sheikh Salman, Infantino is standing against South African businessman Tokyo Sexwale, former Fifa assistant secretary general Jerome Champagne and Jordan's Fifa executive committee member Prince Ali bin al-Hussein. Africa is the continent with most votes. Europe has 53, Asia, 46, Concacaf (North, Central American and Caribbean), 35, Oceania, 11, and the Infantino-supporting Conmebol (South America), 10.